Darrell West was born in Newark, New Jersey on May 24, 1959 to Grace West and Robert Nobles. He attended 15th Avenue Elementary School and later graduated from Vailsburg High School, where he played football. Darrell enrolled in Kean College in Union, NJ and later earned a degree in Computer Programming from Essex County College. Darrell was a loyal New York Giants fan and a diehard New York Knicks fan. He never missed an opportunity to talk or debate about either of his teams. 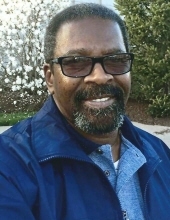 Darrell earned his Boiler Operator License, and was employed by the Piscataway, Plainfield and East Orange Boards of Education, as well as The Veteran’s Hospital of East Orange and Bayonne Hospital. Darrell is survived by his daughter Brianna West, his mother Grace West, an aunt Laura Limbal, his brother Daran (Jean) West, his sisters Ena West, Natalia Davis and Tambi Montgomery. He was preceded in death by his sister Enga West. Darrell also leaves to cherish his memory four nephews Daran, Mikal, Joshua and Omri, four nieces Octavia, Grace, Karen and Kiely, two great nephews Sincere and Elijah, two great nieces Laila and Azzuri, as well as a host of family and friends. This Online Memorial has been created to commemorate the life of Darrell West. Leave a message on the Tribute Wall to share your favorite memories and offer words of sympathy and comfort. To send flowers or a remembrance gift to the family of Darrell West, please visit our Tribute Store. "Email Address" would like to share the life celebration of Darrell West. Click on the "link" to go to share a favorite memory or leave a condolence message for the family.